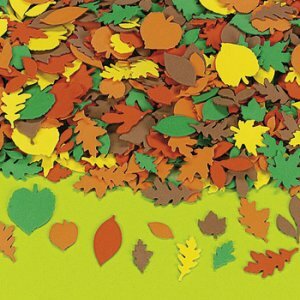 Autumn Self Adhesive Foam Leaf Shapes. These sticky foam shapes are easy for children to use - simply arrange on their picture or craft, then peel and stick. These foam shapes are an essential for schools and Sunday Schools for an open ended range of craft activities. Shapes measure approximately 2cm - 6cm. We made a big picture and the children coloured it in and then used the leaves to stick all over the trees - great team work and it is on our wall.